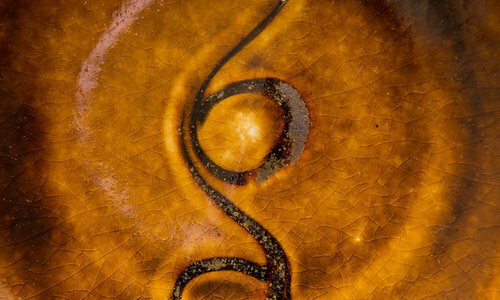 Japanese slipware was adopted from England in the early twentieth century by several of Japan's foremost artists, eventually becoming an important part of the "Mingei," or "Japanese Folk," movement. Slipware is created by brushing or trailing slip (a creamy mixture of water and clay) onto a clay surface before firing, the results depending on the artist's intention. Slipware was first discovered in Japan when the leader of the Mingei movement, Muneyoshi Yanagi, happened upon a book called "Quaint Old English Pottery" in a bookstore in Tokyo. Although slipware was underappreciated and only used for daily tableware in England, Yanagi admired it for its sturdiness, its flexibility as an art form, and its "subtle beauty." Yanagi wasn't alone in his excitement of this discovery. A few of his peers had started experimenting with this utilitarian art form. In 1920, Shoji Hamada, one of Japan's foremost potters at the time, and a friend of Yanagi, accompanied Bernard Leach, the "Father of British studio pottery," to St. Ives, England, with slipware very much on their minds. There, they built the first climbing kiln for St. Ives Pottery, experimenting with local pottery techniques and slipware designs. When Shoji Hamada returned to Japan, two years later, with ten large pieces of native British slipware, Yanagi, along with his peers, admired the pieces for their spontaneity, which is only achieved when an artist works "directly from the heart." Today, several artists throughout Japan continue the traditions of the founders of Japanese slipware, using their imaginations as a guide, and experimenting with new techniques. Our collection includes pieces by four artists: Naoyuki Inoue, Shuji Fukuma, Juro Saito, and Kazuna Yamaguchi. Please visit our Japanese Slipware items for sale here.